AC Schnitzer has announced the availability of a new shift knob with a digital gear readout, available for all BMW and Mini models. We're announcing this knob's got a certain phallic sensibility. Aside from the obvious nonsense of a digital readout on a shifter which only your palm can see, something about the shape of the shifter here gives the knob a certain "Enzytic" sense of length-enhancement when gears at the front of the gate are selected. Or maybe Freud would just have a field day with us (or just Ben — Ed). "Full release" from AC Schnitzer after the jump. AC Schnitzer brings Transparency to Transmissions Gear knob with digital gear display for BMW and MINI models High performance drivers usually play the transmission like a virtuoso: clutch, shift, gas. Depending on the number of gears, the stick passes through the gate up to six times in each direction - up and down again. Which gear are we in now? It's purely a matter of feel, even on modern "manuals".? The new sports gear knob from AC Schnitzer, with its digital display, now not only offers visual feedback as in a sequential box, but enhances the interior as a particularly cool accessory. 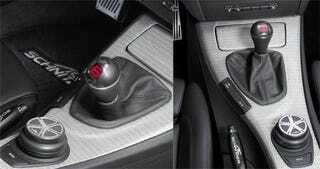 Best of all: it will fit almost all BMW and MINI models with manual transmission, whether brand new or somewhat older. With its bright red digits and thanks to a light sensor the digital display is perfectly visible under all lighting angles and fits perfectly into the typical interior illumination of the vehicles from Munich or Oxford.? Nor do you have to worry about complex installation: the new gear knob can be installed by any workshop, in just a few minutes. As the display changes are triggered by position sensors, apart from a power supply no further wiring is required. And thanks to? AC Schnitzer, you can move up a gear in terms of style!